Skydiving activities are suitable for people aged 16 years and over, with some health and weight limitations depending on the jump chosen. 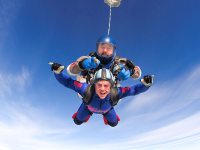 The club welcomes enquiries regard tandem skydiving for disabled people and works with a large number of charities offering sponsored skydives throughout the year. As a half-term activity for 6th form or college students, groups of Scouts or other young people our static line parachuting is popular. Training is in groups of up to 12 people, and we offer camping or onsite dormitory rooms as well as catering facilities. A Visit England Quality Assured Attraction, recognised by Sport England as a national centre and host to the National Skydiving Championships annually. Jumps take place from Hibaldstow Airfield, DN20 9NN. Open for jumping 7 days a week during peak season June/July/August, and 5-6 days a week during mid & low season.